ATO troops retaliated in Novotroitske. Over the past day, the Russia-backed militants in Donbass 28 times opened fire on Ukrainian troops, mostly after dark, the headquarters of the ATO reported. 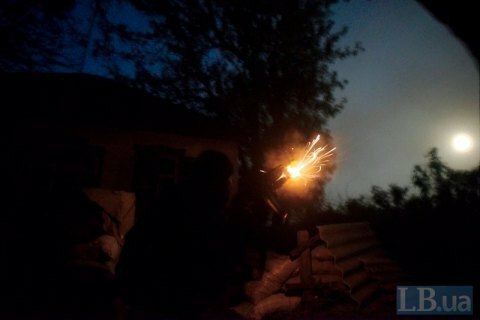 At night, the terrorists twice fired grenade launchers and used heavy machine guns and 82 mm mortars at the positions of the ATO forces south of Avdiyivka. The same calibre mortars were used in the area of Zaitsevo. Small arms were fired at the defenders of Mariyinka. At the Svitlodarsk beachhead near Luhanske, the enemy opened fire from APC-mounted machine guns . In Mariupol direction, the militants opened fire at Shyrokino defenders from heavy machine guns and grenade launchers. In the area of Novotroitske, the enemy used machine guns and an anti-tank missile system. Ukrainian troops opened fire in response and destroyed the enemy fire nest. The militants in Luhansk region intensified provocations last night. Ukrainian positions in the area of Novozvanovka were attacked by the fire from machine guns, anti-aircraft weapons and APC weapons. Near Stanytsya Luhanska the militants fired rocket-propelled grenades. Over the past 24 hours, six enemy reconnaissance drones were detected over the ATO zone. On 25 May, two Ukrainian soldiers were reportedly wounded in Donbas.